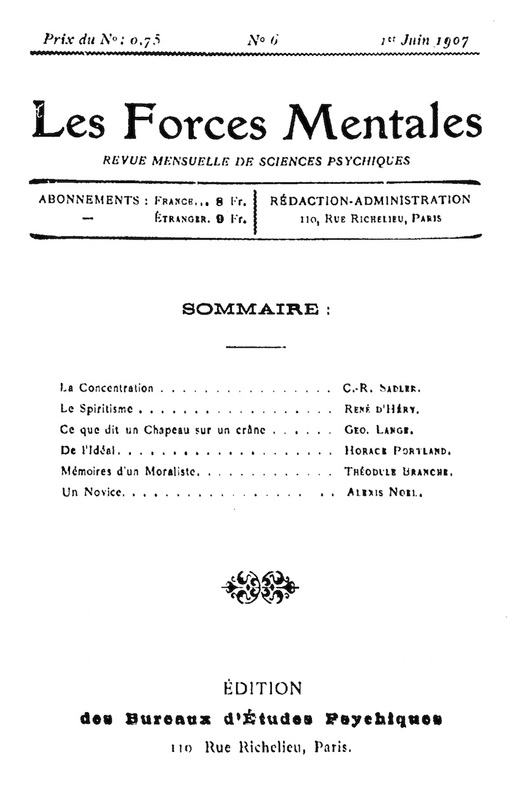 Revue Mensuelle de Sciences Psychiques / Psychologie, Philosopie, Magnétisme, Hypnotisme, Force Pensee, Spiritisme. Paris, France. Language: French. Publisher: Bureaux d’Etudes Psychiques. Editor: Rene d'Hery. 1/1, January 1907. 32 pp., 8 francs a year. This is a pure example of the audacious form of magical New Thought that was dominant in the United States at the time -- the journal recommended one of W.W. Atkinson’s works. It seems to have been intended as a forum for the Bureaux d'Etudes Psychiques and its courses on Psychology, Hypnotism and Personal Magnetism. The articles revealed the wonders of personal magnetism, concentration, self-confidence, mental powers, hypnotism, thought transference, and the journal also included longer, didactic articles on the Kabbala (replete with vague hints of its sexual elements) and phrenology, and short New thought novels. Contributions by Hery, C.-R. Sadler, Georges Lange, Alexis Noel, Eugène Defrance, Theodule Branche, and others outside the mainstream of French occultism and spiritism. The Mercure de France, in reviewing Hery’s and Sadler’s book on L'Education de la Pensee notes the influence on them of the hypnotists and magnetizers and of occultists like Prentice Mulford. BNF.